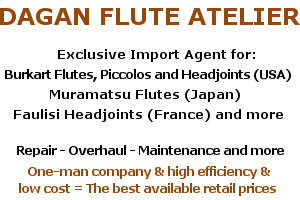 As an authorized (1988) Muramatsu technician/dealer/lover/fanatic, Yizhar Dagan prefers vintage Muramatsu flutes, were made in the 80’s and 90’s. Go here to browse through our extensive collection of available Maramatsu handmade flutes at your leisure. Only the best quality at Dagan Fluitatelier. Take a look inside our Flute Repair & Flute Maintenance workshop! This is where at Dagan Fluit Atelier the flute repair, restoration and adjustment magic happens. After all, to produce fine tunes you need a lot of finetuning.